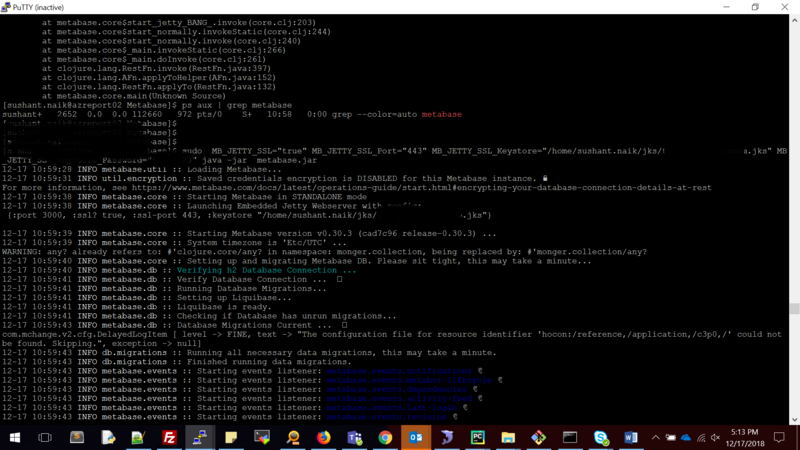 I am using azure(centos 7) environment for my Metabase POC no doubt its an excellent tool we are loving it. Now i am trying to redirect http to https , as per the document in “Using HTTPS with Metabase”(and i am running in the Metabase default server jetty). Anyhow i managed to create the “.jks” and password file by “.crt” using keytool. After the initialization, i tried accessing using https using the port 443 , but i didnt get the luck it was still running on default port 3000. Can anyone please help me out figuring the , where i am doing the mistake . Now the 443 port is able to listen the application , but i am getting the connection error . Is there any feedback on this ? Not easy to give anything else than a guess with the level of detail you share for your certificate setup and specific error you receive. Best guess would be that if you have configured a self-signed (homemade) certificate that your browser rejects it because you haven’t told it to trust it. I am using my organization certificate, what i did is, used the organization cert file to generate the .jks file. Referred the below link to generate the .jks file from keytool. Is the address you’re using the same as in the certificate? Yes the same address . I am getting the error like secure connection failed . and i i need to add any other files along with the .jks file in the location? Did you include the entire certificate chain? No , I have just added the .jks and .p12 files . Is that trusted by the browser? Yes , i am using my organization’s SSL certificate. The https port(443) is started listening but i am not able access in the browser . I am getting error like “Secure Connection Failed” and getting the empty response in Networks. There’s a chain of trust. Make sure the certificate’s issuer is trusted by the browser. Thanks , I will have to check with my IT team.